Map of Asia Showing its Gt. Political Divisions, and, also, the various Routes of Travel, between London and India, China and Japan etc. 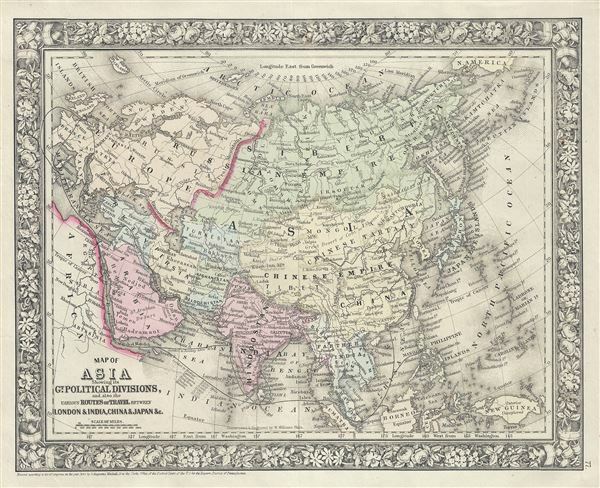 This is a beautiful example of the legendary American map publisher Samuel Augustus Mitchell Jr.'s 1866 map of Asia. This map covers from the Arabian Peninsula and Turkey eastward as far as Kamchatka, Japan, the Philippines and New Guinea. It includes the Empires of Hindoostan (India), China (includes Tibet), Toorkistan, Persia (Iran), Cabool, Beloochistan (Afghanistan), Birma (Burma), Siam (Thailand), Anam (Vietnam), Malaysia, Japan, etc. Also included are adjacent portions of Africa, Europe and Polynesia. The map makes note of the steamship routes and mileages from London to various destinations in Asia. Tibet, Korea and Ladak are included within the borders of the Chinese Empire. Identifies both the Grand Canal and the Great Wall in China. The disputed body of water between Korea and Japan is here identified as the Japan Sea. Taiwan or Formosa is mapped vaguely, representing the poor knowledge of the region prior to the Japanese invasion and subsequent survey work in 1895. Afghanistan is divided into Cabool and the southern province of Beloochistan (Baluchistan). This map also identifies various cities, towns, rivers and an assortment of additional topographical details. Map is color coded according to political boundaries with elevation rendered by hachure. The whole is surrounded by the attractive floral border common to Mitchell atlases between 1860 and 1866. One of the most attractive American atlas maps of this region to appear in the mid-19th century.